Explanation: Often imaged but rarely mentioned, Messier 43 is a large star forming region in its own right. It's just part of the star forming complex of gas and dust that includes the larger, more famous neighbouring Messier 42, the Great Orion Nebula. In fact, the Great Orion Nebula itself lies off the lower edge of this scene. 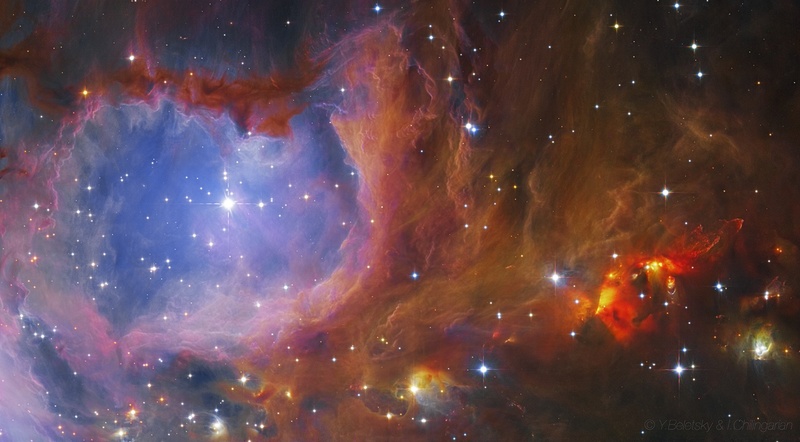 The close-up of Messier 43 was made while testing the capabilities of a near-infrared instrument with one of the twin 6.5 metre Magellan telescopes at Las Campanas Observatory in the Chilean Andes. The composite image shifts the otherwise invisible infrared wavelengths to blue, green, and red colours. Peering into caverns of interstellar dust hidden from visible light, the near-infrared view can also be used to study cool, brown dwarf stars in the complex region. Along with its celebrity neighbour, Messier 43 lies about 1,500 light-years away, at the edge of Orion's giant molecular cloud. At that distance, this field of view spans about 5 light-years.